One lane will be closed on the University Street while two lanes will be open to traffic in each direction. 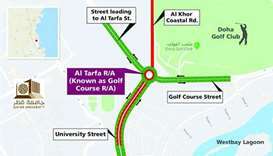 One lane will also be closed and two lanes kept open on all sides of Al Tarfa Roundabout. Two teams coping very differently with English football’s high-intensity mid-season fixture programme meet tomorrow when Premier League leaders Arsenal resume their pursuit of the title at injury-ravaged Liverpool.